"Rebuild your Nation's economy... Develop your society... Expand your influence... On Earth's last surviving continent. Welcome to New Earth..
Just one continent remains home to civilization after a cataclysmic event. Much of the human race has perished - from billions to a few million. The world as we knew it has gone. Those who survived are split into various 'factions' (or proto-nations). Each player assumes the role of a 'government' leader charged with building his/her 'country' by developing existing resources and assets; whilst expending production in the form of consumption and government cash on infrastructure. As much as each nation will want to trade with each other, there remains the probability that political and economical control of land and resources (zones) becomes ever more critical. Progress is measured in terms of social development levels and the emergence of new cities. The higher the Development Levels the higher the value of each zone and thus victory points, but watch out for the 'catastrophes'. 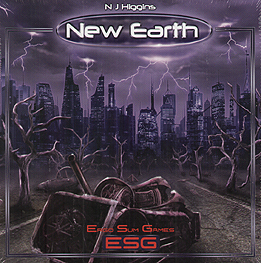 New Earth is a strategy game for 2-4 players with elegant game mechanics combining worker placement with innovative hand management and modular tile design that provides endless game scenarios. Game length is 12 turns and lasts around 60-90 minutes, though players can agree to an extend time-frame.